Written by Wendy Pearson, Digital Inclusion Fellow at Kansas City Public Library, and cross posted from KCPL’s website. As a digital inclusion leader, the Kansas City Public Library provides many ways to engage in digital learning, including a Digital Media Lab for teens, over 300 public access computers available over a ten branch system, recurring computer classes and one-on-one tutoring through our new volunteer Tech Coach program as well as Career Online High School and a Hotspots program in partnership with the local school district. When we discovered learning circles through Peer 2 Peer University, the doors opened to yet another exciting avenue for digital learning! Our system includes ten libraries throughout the urban area of Kansas City. 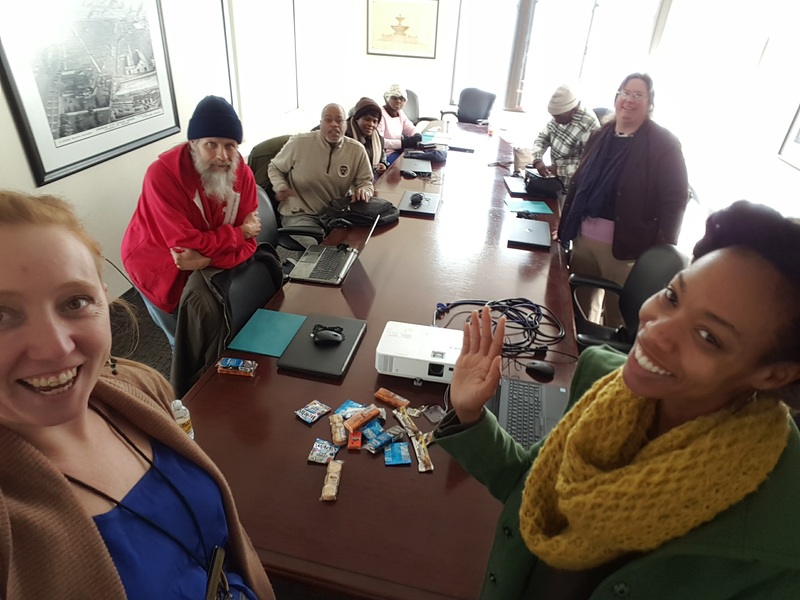 We piloted two learning circles in November-December 2016 at the downtown Central Library, and the Lucile Bluford Branch on the city’s east side. Both locations are on or very near city bus lines and largely serve economically disadvantaged patrons. Our focus right now in digital inclusion is to reach as many people as possible in these populations, but we want to build a strong and sustainable foundation, so we selected these two locations as a good starting point to pilot digital literacy focused learning circles. In mid-October, facilitators of Peer 2 Peer University (P2PU) visited our library to host interactive training for 12 Kansas City Public Library staff members and thoroughly introduce the concept of learning circles. P2PU also provided guidance for two designated library staffers as they created a course plan, implemented a marketing campaign, and brainstormed a name for the course. The course, “Make the Internet Work for You!,” was conducted Tuesday mornings at the Central Library and repeated in the afternoons at Bluford. We designed and distributed signage to promote the course opportunity and visited each library location to hand-distribute quarter-page flyers to patrons. Staff at each branch also helped get the word out by word of mouth, especially to patrons who came to them with computer questions. The first session of our course was November 15 and totaled 19 registrations, ten at Central and nine at Bluford. COURSE TIME: Make the Internet Work for You! We designed our own online course for digital literacy using components of gcflearnfree.org, a source for content of many of our existing computer classes. We promoted the course as generally covering the internet but waited until Day 1 of meeting as a group to determine our precise content. We opened it up to discussion and surveyed our learners about their goals and what they wanted to learn! Following initial introductions and discussion about the direction of our course, we dove right in to getting everyone set up with a Gmail account. Gcflearnfree.org has a great set of modules that cover Gmail, and we started by going through them to get everyone to a baseline. This initial experience set the tone for all the following sessions. Nearly everyone in the class was at a beginning level regarding computer skills so we opted to go through activities and modules together as a group. No one in either learning circle opted to work on their own at that time. However, at the beginning of each session, we emphasized the availability of this resource outside of group time and encouraged participants to access gcflearnfree.org from home or the library’s computers if they chose to progress through other modules or work through our course at a different pace. The facilitator reviewed modules before group sessions to select the videos and narratives relevant to the skill level and goals of our learners. We played videos and paused frequently for participation activities and discussion. Participants took turns reading the narrative sections of the modules aloud. We again paused several times in each section to provoke discussion and activities. Pre-assessment screening and adequate promotion time are crucial! While we did retain 70% of our participants over the course of five weeks, we were still sad to lose a few as the course progressed. We are very confident the reason was because those learners did not have the appropriate foundation of skills to participate and were quickly overwhelmed and discouraged. By not giving ourselves enough time to get the word out about our learning circles, we were hasty to accept any person who registered. While the promotional materials and staff did convey the need for basic digital literacy skills, an assessment test would be more effective in getting this point across. There’s a risk when we rely on patrons to accurately rate their own skill level within an area they know little about. Thirteen participants completed the “Make the Internet Work for You!” learning circle this fall. We designed certificates of completion with each participant’s name and awarded them as part of a “graduation package.” Other contents included a 30-day bus pass, $5 printing credit on their library card account, earbuds and an 8GB flash drive. We promoted the “graduation package” as an incentive to register and complete our learning circle. Participants had to attend all five sessions to be eligible for the package. We understand that investing five weeks to participate in a learning experience is very difficult for our target population when they often seek more urgent and immediate answers to their life challenges. For example, when people struggle to pay their rent or utility bills, they probably understand that computer skills may eventually help their economic situation but simply do not have the luxury of time to invest in improving those skills. So, we wanted to offer something valuable and practical to keep them engaged in our course. Thanks to designated funding, we provided a graduation package valued at $60 for each graduate! Graduation was “bittersweet,” as one participant declared. She was pleased to have completed something and learn about the internet but was going to miss coming together with her new friends each week. However, we used this as an opportunity to promote our next learning circle. It is our priority to retain members of our learning circles and keep them engaged in the experience to provide a continuum of digital skills learning, from computer basics to more advanced software navigation. Despite their diversity in backgrounds and skill levels, participants in both learning circles gained new digital skills and an acquaintance with one another. Several became “Facebook friends” and plan to keep in touch through their newly acquired social media skills. The library will facilitate learning circles over a spectrum of topics, not limited to digital literacy. We plan to include advanced digital literacy courses like coding and web design but are excited to open the doors to all the possibilities afforded by massive open online courses! Patrons will acknowledge they have the capacity to become learning circle facilitators. Using the library’s space and resources, patrons will become leaders and begin to develop their own groups. We will continue to share our story within and beyond our own community to inspire others to engage in this method of learning and social development. Our experiences will help other organizations and communities access and get connected to vital resources they may not know existed. We have our next round of Learning Circles at Central (Feb. 14-March 14). Click here to register: Central.